This year’s Tanglewood Festival of Contemporary Music, presented from Wednesday, August 3 through Sunday, August 7, was directed by Charles Wuorinen, who in an earlier era was often considered an academic, serial composer. He is no stranger to the TFCM, having first served on its faculty in 1970, and many of the composers whose music was performed were either his colleagues or former students. Fred Ho’s Fanfare to Stop the Creeping Meatball, a world première commissioned by the TFCM, was programmed to open all of the concerts except Sunday’s “Prelude” — although it was finally excluded from the Saturday afternoon one. On Thursday night it was performed from the center of the front balcony by Alex Fioto and Najib Wong, trumpets, and Douglas Rosenthal and Paul Jenkins, trombones. Is brief, jazzy, close harmonies and dense textures — short, humorous sentences strung together — set a jolly mood. The rest of the first half featured members of the Ensemble Signal, conducted by Brad Lubman, whose expressive but subdued use of his entire body (rather than a baton) is a model of its method. Tobias Picker’s Sextet No. 2, “Halle’s Ravine” (1977), was performed by Jackie LeClair, oboe; Bill Kalinkos, clarinet; Christopher Otto, violin; Lauren Radnofsky, cello; Bill Solomon, vibraphone and marimba; and Oliver Hagen, piano. The three movements were all studies in instrumental color in various combinations, marked by dynamic contrasts. Jason Eckardt’s Rendition (2006), for bass clarinet and piano, played respectively by Kalinkos and Hagen, opens with a low growl from both instruments, from which the bass clarinet eventually emerges with notes spreading higher, some bending upwards. There then are a series of crashing chords in the piano, an amazing feat of power and endurance on the part of Hagen, followed by slow, contrasting single notes to close. Brian Ferneyhough’s Terrain (2005), like much of his music, ferociously difficult, was written for solo violin and chamber ensemble. 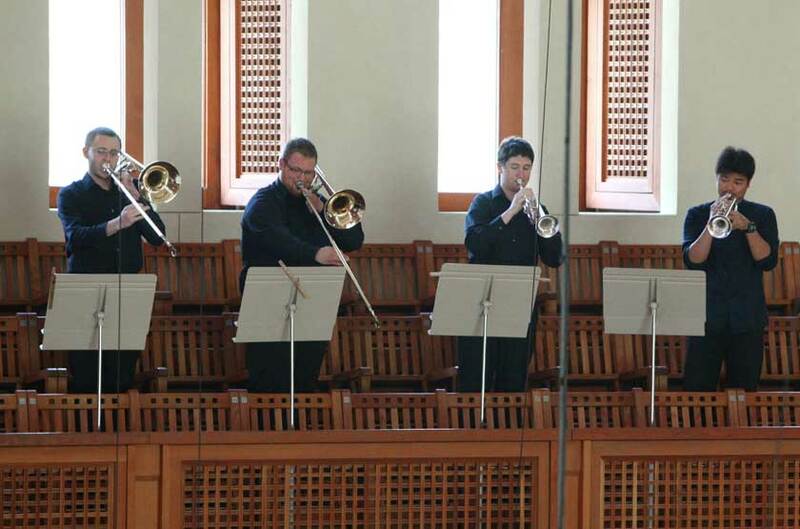 Performers in this concert were Otto, violin; Kelli Kathman, flute/piccolo; LeClair, oboe/English horn; Kalinkos, clarinet/bass clarinet; Brad Balliett, bassoon; Nathan Koci, horn; Mike Gurfield, trumpet; Steven Parker, trombone; and Greg Chudzik, double bass. The violin opens with fragmentary phrases, then is joined by low instruments (bass clarinet, double bass, bassoon), finally expanding to include all, slowly building to a long climax, from which there is a short dénouement, and a brief end vanishing into the air. A tribute to the late Milton Babbitt was a performance, after intermission, of his More Melismata (2006), by the extraordinary cellist, Fred Sherry, who exhibited incredible control of Babbitt’s pitches as they gleefully hop around with great complexity, ending in a final sigh. Perhaps the most dramatic work I heard during these days was John Chowning’s Voices (2005, rev. 2011), for soprano and electronics. Soprano Amy Petrongelli entered tentatively from stage left while the audience was still settling down. In her rich, mellow voice, sometimes amplified and sometimes not, she sang excerpts from various Greek poets (no texts provided) in microtonal intervals, turning and gesturing here and there, as she walked slowly to center stage, and then ascended to the higher levels provided. Meanwhile the electronics both commented on, and incorporated her voice in amplified droplets, becoming louder, almost drowning Petrongelli’s voice as she started down the stairs to end the work stage center on an extended low note supported by low-pitched electronics. This was altogether a dramatic mix of visual and sonic beauty. John Zorn’s À Rebours (in memoriam György Ligeti), commissioned by the TFCM, was premièred by Fred Sherry as solo cellist, and a group of nine players comprising mostly New Fromm players on flute, clarinet, percussion, harp, violin, viola, and cello. The work begins with Sherry’s solo introduction, to which the other instruments slowly join in long phrases, building to a noisy cacophony with some pauses. The phrases then morph into really beautiful individual instrumental sounds and harmonies to close. Saturday afternoon’s concert, in the Theatre rather than Ozawa Hall, was a bit of a disappointment, and not just because the performers were all students, save one New Fromm Player; all performances were polished. The program included only three long works of fiendish difficulty. The order of the announced program was wisely changed so that it opened with Jonathan Keren’s Multiscala (2007), for mandolin and string trio. This turns out to be a combination that does not work very well, because when the dynamics are loud, the mandolin completely covers the string trio, making their lines inaudible. The piece stops and starts a lot, and the most balanced section involves pizzicato for all. This was followed by Jo Kondo’s Beginning, Middle, and End (1987), for flute/bass flute and string quartet. Kondo provided soft, fragmented phrases, nevertheless connected by common pitches and harmony, the same basic harmony being treated in different ways. George Flynn’s fifty-minute Pieces of Night (Three American Nocturnes), for solo piano, is part of a longer work written between 1986 and 1989 in response to the Vietnam War. The three Nocturnes, performed with amazing skill by Nolan Pearson, were interspersed with two “Myocloni” (Muscle spasms), performed on another piano by the composer. The Nocturnes are subtitled (respectively) Turmoil, Nightmare, and Tumult and Lullaby. “Turmoil” begins gently with single pitches, but quickly leads to the “turmoil,” based on much repetition of loud harmonies and pitches. “Nightmare” generally explores the lower range of the piano and makes use of repetitive arm slams. “Tumult and Lullaby” are much like the second Nocturne, generating the question, How much repetition can a person stand? Sunday evening’s “Prelude” concert was performed in its entirety by the amazing long-time advocate of contemporary music, pianist Ursula Oppens. Jason Eckardt’s Cuts (1996), retains the “harmonic, rhythmic, and textural characteristics: as invariant, while the music’s registral, dynamic, and timbral aspects witness continual mutation.” The result is a piece that begins with noisy clusters in the bass, changing to high, random, small clusters, then a quieter series of chords, slowing down at the end—again, repetition is constant. Milton Babbitt’s It Takes Twelve to Tango (1984) is a witty, two-and-a-half-minute twelve-tone tango, performed accordingly. Bernard Rands’ three-movement Tre Espressioni (1960) was the earliest work of the Festival, and well worth resurrecting. It makes pointillistic use of individual pitches and small chords, and Rands certainly knows how to pick the right notes for each sound or group. Jo Kondo’s High Window (1996) is characterized by transparency, a constant beat, and repeated chords in the upper registers punctuated by low single notes. Tobias Picker’s Four Études for Ursula (1996) provided a fitting climax for the program, in that three of its four movements were fast and difficult. The third movement, “Legato espressivo,” provides a melody in the right hand while the left counters with either a melody or chords. Of the fourth movement, the composer writes that it “studies the difficulties of polyrhythm, simultaneous melodic lines, and expansive chords in the context of sheer bravura and pianistic force . . . a study in endurance.” You get the idea. As usual, the final concert of the Festival comprised works for full orchestra — in this case mostly huge, with eight double-basses—conducted by different student composers: Case Scaglione, Ken-David Masur, and Robert Treviño, with the finale conducted by TFCM faculty member, the expert Stefan Asbury. Ho’s opening Fanfare was played this time from downstage right, setting the tone for Andrew Norman’s Drip Blip Sparkle Spin Glint Glide Glow Float Flop Chop Pop Splatter Splash (2005), commissioned by the Minnesota Orchestra for its Young People’s Concerts. Whatever ones age, the work establishes a high energy level and shows off the possibilities of instrumental color in the orchestra. Jo Kondo’s In Summer (2004) begins and ends quietly, a study in orchestral wide space and color in a very different mode. The title of Felipe Lara’s Onda (2007) means “Wave,” which is suggestive of the work’s rushes of orchestral color, beginning in the winds and harp. David Felder’s Inner Sky (1999) is a revision of an earlier work (November Sky, 1992), now for solo flutes (piccolo, flute, alto flute, bass flute), all smoothly performed in turn by New Fromm Player Marie Tachouet, four percussionists, amplified piano, strings, and computer processed sounds (also derived from pre-recorded flutes) delivered in surround sound. As might be surmised from the use of the various flutes, the work is sectional, a complex pitting of the flutes with various other instrumental and electronic colors. Christopher Rouse’s Phaethon (1986) is for very large orchestra, including a huge battery of percussion (with metal sheets of two sizes). At the speed and dynamics required, it is very difficult for the orchestra to be crisp. In fact it could be said that this is simply a loud and raucous work, except that under Stefan Asbury’s direction, it achieved intelligible shape, and brought the house down in the final enthusiastic applause of the festival.